How often do you clean your roof? While not the most glamorous task, regular roof cleaning is essential to maintaining the integrity of your roof. Our roof cleaning chemicals and products guide offers essential information on eco-friendly roof cleaning products and professional roof cleaning methods to ensure your roof lasts a long time. It’s usually best to call in a professional who can safely perform the work for you. However, if you’re set on attempting a DIY roof cleaning project, you’ll need to take care to navigate your roof safely. Plan ahead to start at one end of the roof and avoid walking on wet or slippery spots. Always walk where the tiles overlap since this is the strongest part of your roof. If you are going to use tools to clean your roof, we recommend using a bucket tied to a rope to hoist these tools and supplies up the ladder, rather than carrying them as you scale the ladder, which can pose a safety risk. What Causes Roof Shingles To Get Dirty? One of the most obvious signs that you need to have your roof cleaned is that your roof shingles are dirty. The most common cause of dirty roof shingles? Falling debris. Leaves, sticks and branches can fall or be blown onto your roof by wind or get left there by birds. Most of the time, rain will rinse most of this debris away. However, if an excess of debris collects on your roof, it will start trapping moisture and gradually decompose, creating a fertile environment for rot, moss and mould. Unfortunately, if left unfixed, this debris can even cause extensive damage, such as rotting in the roof decking or roof leaks, which can cause damage to the interior of your house. This makes regularly cleaning debris from your roof an important preventative measure against costly roof repairs. If the debris is light, you can likely remove the debris with your hands, or a small plastic scoop and a soft-bristled brush. However, if the debris is thicker, using an air blower or soft-bristled broom are the simplest methods. If you decide to use a soft-bristled broom to clear the debris off your roof, remember to avoid applying too much pressure. Putting too much pressure on the surface of your roof when cleaning can strip away the protective roof granules that shield your roof from harmful UV rays, reduce your roof’s lifespan, and even void your roof’s warranty. While you’re up close and personal with your roof, this is the perfect time to look at the condition of your roof. If your roof has many missing roof granules, this is a clear sign that it may be time to replace your roof. The best roof cleaning products are eco-friendly. 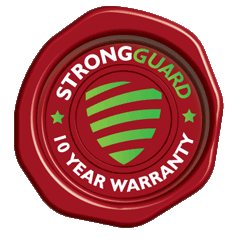 At Strong Guard, we are dedicated to using only high-quality, environmentally-friendly products to clean your roof. 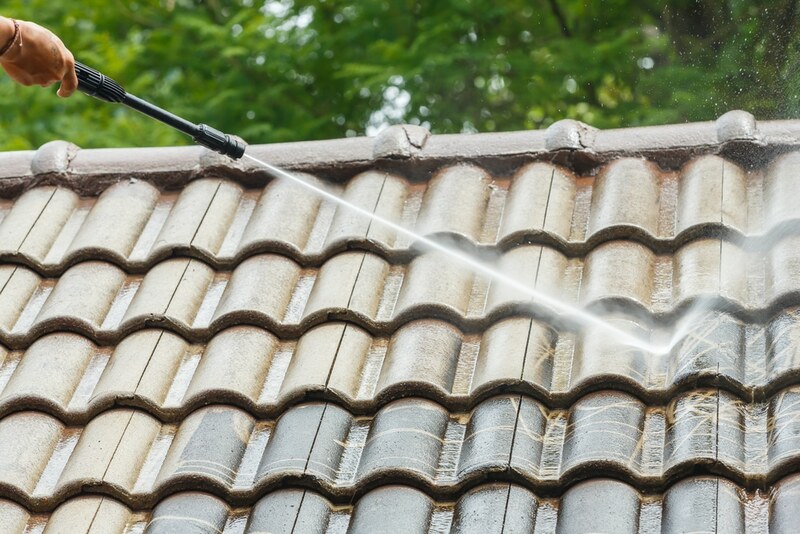 A word of warning: Avoid using strong chemical-based cleaners to clean your roof, as these are notorious for harming your home’s garden and landscaping, trickling into waterways, and negatively wreaking havoc on the environment. Organic growth such as mould can erode your metal Colorbond roof’s protective paint, exposing the bare roof sheets to harsh sunlight and weather, ultimately causing rust and decreasing its lifespan. An annual checkup and clean by an experienced roofing company will help keep your roof looking its best and stop this rust and mould from growing on your roof and in your gutters. How do we do this? Our roofing specialists use a mid to high-pressure machine water wash with wastewater, filtered via disconnect downpipes or via a pump to the lawn or garden. Cleaning a terracotta roof is a multiphase process. First, our roof cleaning specialists will start by washing the roof tiles with clean water. Next, they will apply Mouldshield C, an economical biodegradable and dilutable high powered cleaner. This cleaner will immediately start to kill the spores of any organic growth present like algae, fungi, lichen or moss. They will leave the solution on your roof for up to 24 hours. This is an important step, as it will help inhibit re-growth and ensure your tiles remain strong and intact. Finally, we will clean your roof with a high-pressure power wash with filtered wastewater. For a concrete tile roof, we recommend hiring a professional to use a high-pressure water blaster to clean your roof with wastewater. This is the most effective and environmentally-friendly solution. Roof cleaning is an essential part of maintaining and keeping your home in good condition. Making sure your roof is annually cleaned by a professional will greatly improve your house’s curb appeal and help prevent against costly damage such as roof leaks. A clean, well-cared for roof will last for years to come. Looking for a professional team to clean your roof in Brisbane? Contact the roofing experts today on (07) 3623 4422 for a quote!